Easter Lily comes alive each Easter. She has one goal and one goal only. Her goal is to make sure everyone in the garden is happy. If there is even one person in the garden that is sad, Easter will not come. Renee Chickadee flew above Easter Lily’s head as she walked through the garden. Renee spotted something on the garden pathway that she didn’t notice before. “That is strange,” said Renee. 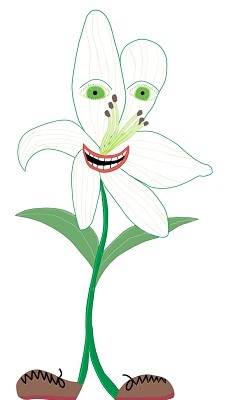 “What is strange?” asked Easter Lily. Renee landed on the pathway and took a closer look. She saw lots of jellybeans all over the pathway. “This could explain why nobody in the garden was sad this Easter,” said Easter Lily, picking up a handful of jellybeans off the ground and eating them. “They are,” said Renee, trying one. “There is no way anyone will be sad after eating these,” said Easter Lily. Easter is a happy time. Example: Easter Lily and Renee Chickadee found some jellybeans and they were the reason everyone in the garden was happy. 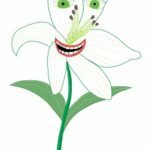 This entry was posted in Easter Lily Stories, Easter Stories, Easter Story Challenge 2018, Grade 4 Level and tagged Easter, Easter Lily, garden, happy, jellybeans. Bookmark the permalink.